Pediatric dental exams are more extensive than just looking at the teeth. The dentist performs a review of the childs health history to determine if there is a need for any special dental care. The examination will note the health and condition of the teeth, gums, soft tissues, head and neck. The dentist also monitors the growth of the jaws and development of the teeth, and evaluates any oral habits, such as thumb sucking. The pediatric dentist will use all of these factors to make a diagnosis and create a custom treatment plan and instructions for home care. The dentist or hygienist will clean the childs teeth to remove any plaque or calculus. Without treatment, this build up can cause gum disease and tooth decay. The dentist will also treat the teeth with fluoride to strengthen them and make them resistant to tooth decay. Cleanings and fluoride treatments are recommended twice a year to maintain your childs dental health and prevent decay. Prevention is a vital part of your childs dental care. The dentist will provide instructions and tips on home dental care, such as brushing techniques. The dentist may also provide a list of foods and habits that should be avoided. Pediatric dentists are careful to minimize the exposure of your child to radiation. Lead body aprons and shields help protect the child's body, and modern dental equipment is designed to focus the x-ray beam only where needed and filter out unnecessary x-rays. Use of high-speed film and digital x-rays help minimize radiation exposure. Panoramic x-rays may sometimes be necessary to view the child's entire mouth and jaws. It shows any permanent teeth that are missing, abnormal growth, extra teeth or other oral issues. A panoramic is typically scheduled when a child's 6th year molars erupt and then once every 3-5 years after that. Sometimes a panoramic may be recommended if there has been physical trauma to the jaw. Pediatric dentists use sealants to help prevent tooth decay. Sealants are made of clear plastic and are applied to the chewing surface area of the tooth. 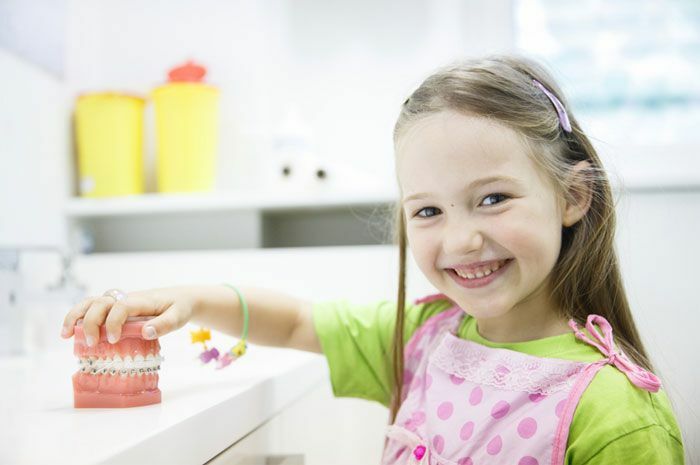 Some teeth tend to have depressions and grooves which are difficult for the child to clean. Sealants are used to fill these depressions to deter tooth decay. Application of the sealant is quick, painless, and can be effective for many years if your child practices good oral hygiene and avoids biting hard objects. Baby teeth hold the spacing for the permanent teeth and help guide the permanent teeth into position. Baby teeth allow for normal development of the childs jawbone and muscles. When baby teeth fracture due to decay or trauma and a filling is required on more than one surface of the tooth, the pediatric dentist may recommend the placement of a crown over the baby tooth instead of a filling. The filling may decay again, break or wear out, and the tooth will then require another restoration. A crown is more durable than a filling, and should last until the child's adult teeth come in. In many cases the crown results in less expense to the parent and less trauma to the child. When the pulp has been injured by trauma, decay or other causes, endodontic treatment is usually the best way to try to save the tooth. Unless a childs tooth is about to fall out, a dentist may recommend endodontic treatment on a child's primary(baby) tooth. Without treatment, the child will experience pain or discomfort, and infection may result. Early extraction of the primary tooth is usually not advisable because primary teeth are necessary for chewing and for learning proper pronunciation during language development. Also if a baby tooth is extracted too early, neighboring teeth can shift and occupy some of the vacant space making it difficult for the permanent tooth to grow in properly. You may also call 209-441-5100 to schedule your appointment.